Have you read that post? Well, congratulations cause that was really lengthy and thank you! As I have mentioned in my post, there is a nicer piece I wrote that was for publication. 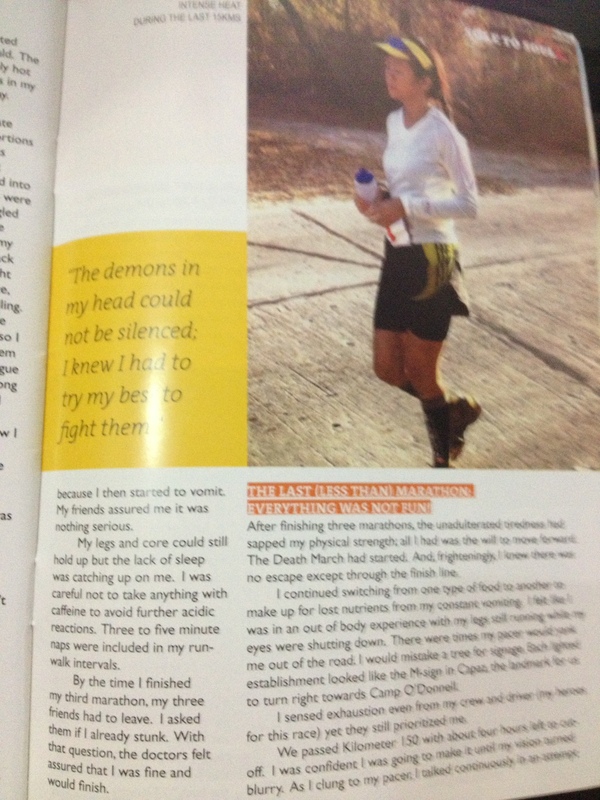 It was published in the March-April issue of The Bull Runner Magazine. 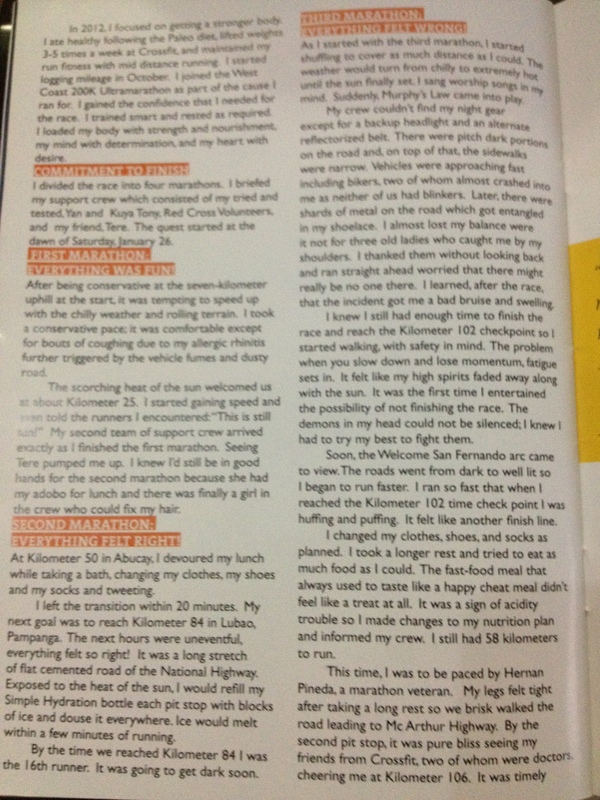 Thank you very much Jaymie Pizzaro (The Bull Runner) for the rare chance to be able to share my story. I would like to share it now, with hope that it could help those still dilly-dallying if they should do it. There are only three commitments you need to make before you decide to March for Life…. The Bataan Death March 160K Ultramarathon is organized by Philippine Association of Ultrarunners’ Retired General Jovie Narcise (more commonly known as the Bald Runner). It is a run in honor of our grandfathers who marched the road from Mariveles, Bataan to Camp O’ Donell in Tarlac when they were transferred as prisoners of war in 1942. 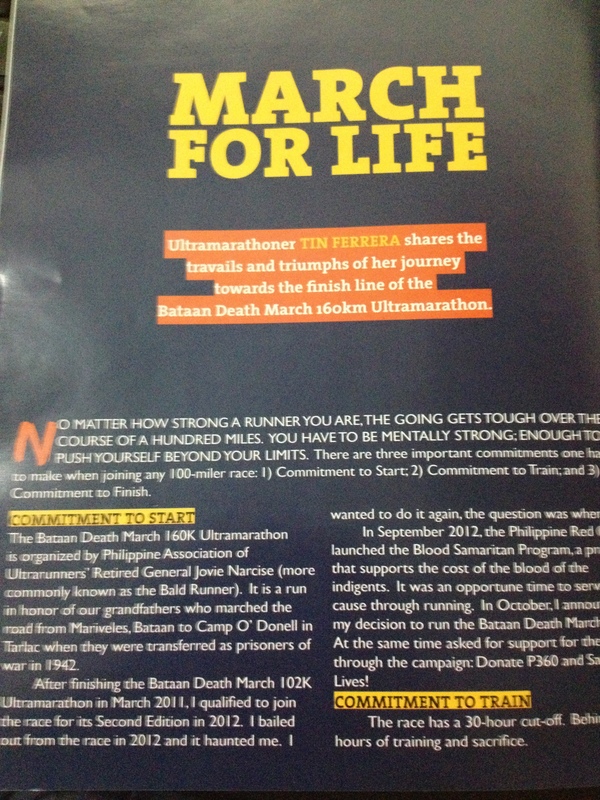 After finishing the Bataan Death March 102K Ultramarathon in March 2011, I qualified to join the race for its Second Edition in 2012.I bailed out from joining the race in 2012 and it haunted me. I wanted to do it, the question was when? In September 2012, the Philippine Red Cross launched the Blood Samaritan Program, a program that supports the cost of the blood of the indigents. It was an opportune time to serve the cause through running. In October, I announced mydecision to run the Bataan Death March 160k. At the same time asked for support for the cause through the campaign: Donate P360 and Save Lives! The race has a 30-hour cut-off. Behind it is hours of training and sacrifice. In 2012, I focused on getting a stronger body. I ate healthy following the Paleo diet, lifted weights 3-5 times a week at Crossfit, and maintained my run fitness with mid distance running. I started logging mileage in October. I joined the West Coast 200K Ultramarathon as part of the cause I ran for. I gained the confidence that I need for the race. I trained smart and rested as required. I loaded my body with strength and nourishment, my mind with determination, and my heart with desire. I divided the race into four marathons.I briefed my support crew which consisted of my tried and tested, Yan and Kuya Tony, Red Cross Volunteers, and my friend, Tere. The quest started at the dawn of Saturday, January 26. First Marathon: Everything was Fun! After being conservative at the seven-kilometer uphill at the start, it was tempting to speed up with the chilly weather and rolling terrain. I took a conservative pace; it was comfortable except for bouts of coughing due to my allergic rhinitis further triggered by the vehicle fumes and dusty road. The scorching heat of the sun welcomed us at about Kilometer 25. I started gaining speed and even told the runners I encountered: “This is still fun!”My second team of support crew arrived exactly as I finished the first marathon. Seeing Tere pumped me up. I knew I’d still be in good hands for the second marathon because she had my adobo for lunch and there was finally a girl in the crew who could fix my hair. Second Marathon: Everything Felt Right! At Kilometer 50 in Abucay, I devoured my lunch while taking a bath, changing my clothes, my shoes and my socks and tweeting. I left the transition within 20 minutes.My next goal was to reach Kilometer 84 in Lubao, Pampanga. The next hours were uneventful, everything felt so right! It was a long stretch of flat cemented road of the National Highway. Exposed to the heat of the sun, I would refill my Simple Hydration bottle each pit stop with blocks of ice and douse it everywhere. Ice would melt within a few minutes of running. 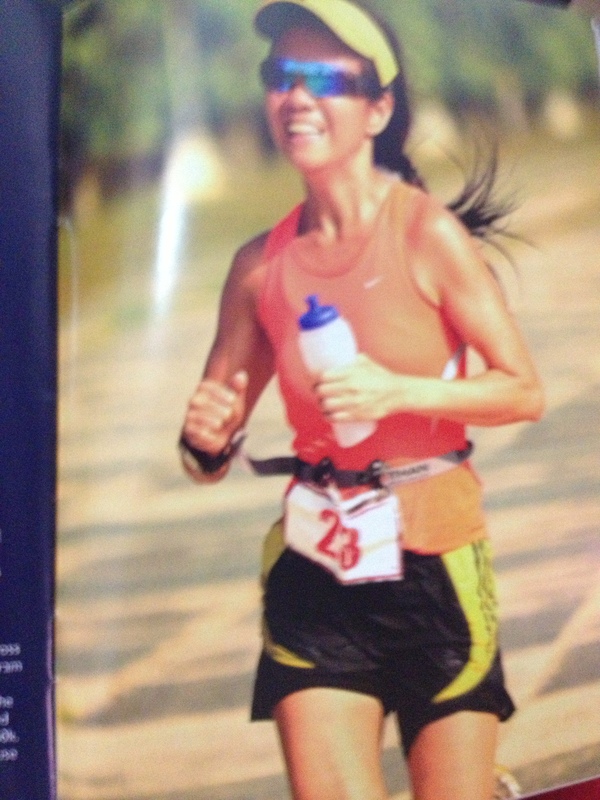 By the time we reached Kilometer 84 I was the 16th runner. It was going to get dark soon. Third Marathon: Everything Felt Wrong! As I started with the third marathon, I started shuffling to cover as much distance as I could. The weather would turn from chilly to extremely hot until the sun finally set. I sang worship songs in my mind. Suddenly, Murphy’s Law came into play. My crew couldn’t find my night gear except for a backup headlight and an alternate reflectorized belt. There were pitch dark portions on the road and, on top of that, the sidewalks were narrow. Vehicles were approaching fast including bikers, two of whom almost crashed into me as neither of us had blinkers. Later, there were shards of metal on the road which got entangled in my shoelace. I almost lost my balance were it not for three old ladies who caught me by my shoulders. I thanked them without looking back and ran straight ahead worried that there might really be no one there. I learned, after the race, that the incident got me a bad bruise and swelling. I knew I still had enough time to finish the race and reach the Kilometer 102 checkpoint so I started walking, with safety in mind. The problem when you slow down and lose momentum, fatigue sets in. It felt like my high spirits faded away along with the sun. It was the first time I entertained the possibility of not finishing the race. The demons in my head could not be silenced; I knew I had to try my best to fight them. Soon, the Welcome San Fernando arc came to view. The roads went from dark to well lit so I began to run faster. I ran so fast that when I reached the Kilometer 102 time check point I was huffing and puffing. It felt like another finish line. I changed my clothes, shoes, and socks as planned. I took a longer rest and tried to eat as much food as I could. The fast-food meal that always used to taste like a happy cheat meal didn’t feel like a treat at all. It was a sign of acidity trouble so I made changes to my nutrition plan and informed my crew. I still had 58 kilometers to run. 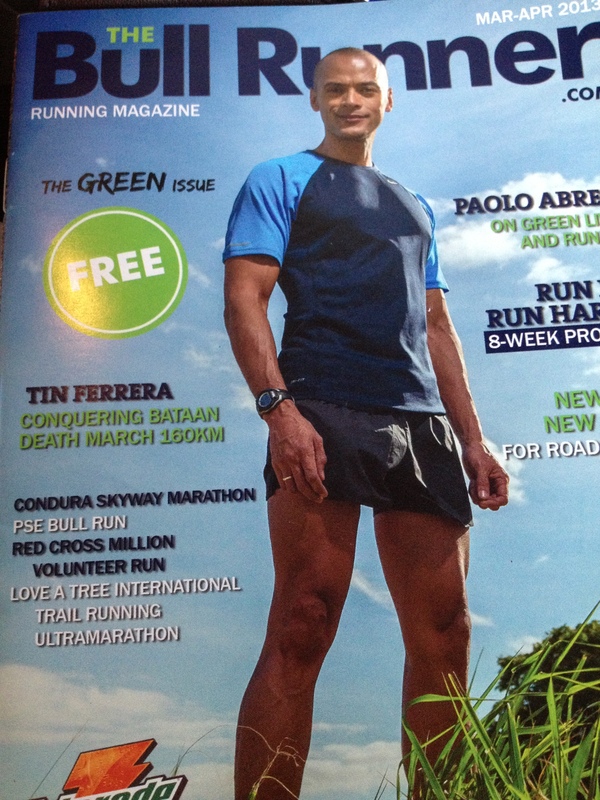 This time, I was to be paced by Hernan Pineda, a marathon veteran. My legs felt tight after taking a long rest so we brisk walked the road leading to Mc Arthur Highway. By the second pit stop, it was pure bliss seeing my friends from Crossfit, two of whom were doctors, cheering me at Kilometer 106. It was timely because I then started to vomit.My friends assured me it was nothing serious. My legs and core could still hold up but the lack of sleep was catching up on me. I was careful not to take anything with caffeine to avoid further acidic reactions. Three to five minute naps were included in my run-walk intervals. By the time I finished my third marathon, my three friends had to leave. I asked them if I already stunk. With that question, the doctors felt assured that I was fine and would finish. The Last (Less Than) Marathon: Everything was Not FUN! After finishing three marathons, the unadulterated tiredness had sapped my physical strength; all I had was the will to move forward. THE DEATH MARCH HAS STARTED. And, frighteningly, I knew there was no escape except through the finish line. I continued switching from one type of food to another to make up for lost nutrients from my constant vomiting. I felt like I was in an out of body experience with my legs still running while my eyes were shutting down. There were times my pacer would yank me out of the road. I would mistake a tree for signage. Each lighted establishment looked like the M-sign in Capaz, the landmark for us to turn right towards Camp O’Donnell. I sensed exhaustion even from my crew and driver (my heroes for this race) yet they still prioritized me. We passed Kilometer 150 with about four hours left to cut-off. I was confident I was going to make it until my vision turned blurry. As I clung to my pacer, I talked continuously in an attempt to convince myself it was nothing serious. When I felt better, I hurriedly crossed the street and took a nap on the pavement. It felt like a walk of shame. My heart was battling my mind and body over quitting. Amid all these,I was reminded of the reasons I endured 152 kilometers: the Red Cross Blood Samaritan Program, a friend to whom I promised to offer this run for his mother who passed away, those who suffered on these roads, and those who are currently suffering worse than me at that moment. I got up and ran. As I covered the roads, I looked up, then I saw it: the turnaround point. We were near the end. At that point, the marshal looked like St. Peter handing me the key to heaven. In real life, it was the heaven on earth, a mere five kilometers away. I kept on running and I even hit my normal race pace at some portions of the route that I almost missed the right turn towards the last 400 meter of the race. It was the best 29 hours “SPRINT”. I outsprinted my heart which broke every time my mind and body was winning. 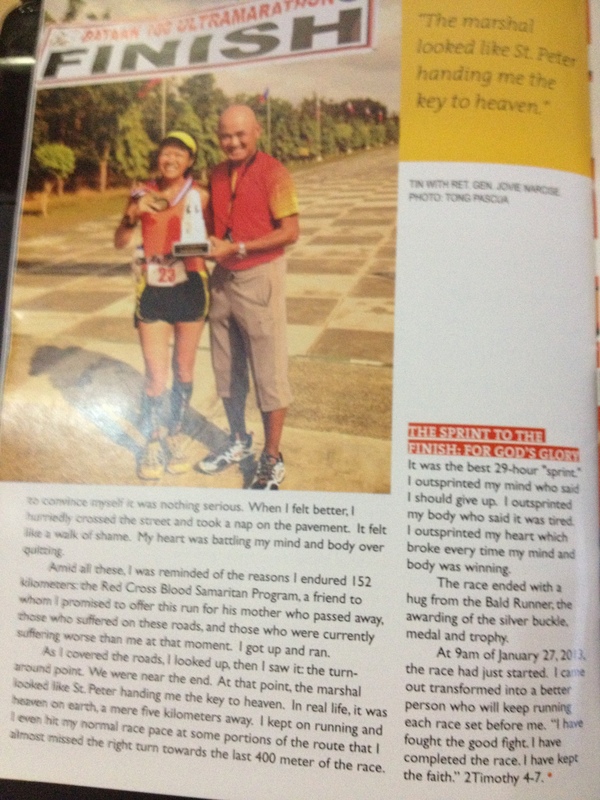 The race ended with a hug from the Bald Runner, the awarding of the silver buckle, medal and trophy. At 9am of January 27, 2013, the race had just started. I came out transformed into a better person who will keep running each race set before me. “I have fought the good fight. I have completed the race. I have kept the faith.” 2Timothy 4-7.